Notes: A cluster of German settlers formed in the eastern part of the Town of Perry. It was difficult for them to attend church in the 1850s and often long trips on foot or by oxen were necessary to attend church at Cross Plains or at Pine Bluff. In 1859, after one of these early settlers had to walk 26 miles to get a priest to administer the last rights for Caroline (Post) Keller, and then the family had to transport her body back to Madison for burial. Spring Valley Catholic settlers organized as San Salvador Church of the Holy Redeemer. 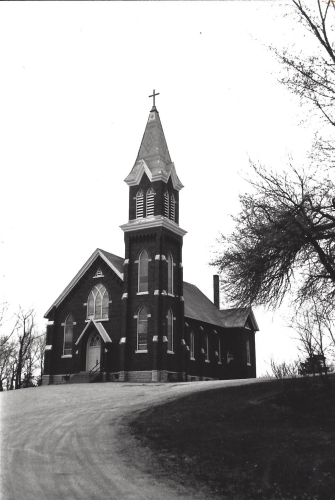 By 1861 the 29 families of the congregation had raised enough money ($618) to build themselves a church.